The retreat starting on April 26th is now full. The next retreat will be on the weekend of May 24th. Registration for that retreat will open soon. To be notified when registration opens, join our newsletter using the blue box on this page. You can also join the wait list for the April 26th retreat by sending us a message through the contact page. Join us for a weekend of mindfulness meditation practice in a beautiful green valley in the Sierra de Madrid. The teacher, Darran Kilbride, has trained in world-recognized meditation centers in the United States and Asia and has trained as a mindfulness teacher with the University of Massachusetts. The retreat will be taught in English. The best way to experience these benefits is to have a daily meditation practice and to periodically spend time on meditation retreats. By setting aside an extended period of time in supportive conditions (beautiful nature, meditation teacher, other people practicing alongside you, less distractions and responsibilities), a retreat allows you to deepen your practice and to more fully experience the benefits of meditation and mindfulness. If you would like to deepen (or re-start) your meditation practice, then this retreat is a great way to do that. 6 – 8pm Arrive, check in, explore the center, meet the other participants. 9 – 10pm Sitting meditation. Questions and answers. The center is in a beautiful green valley in Cercedilla. 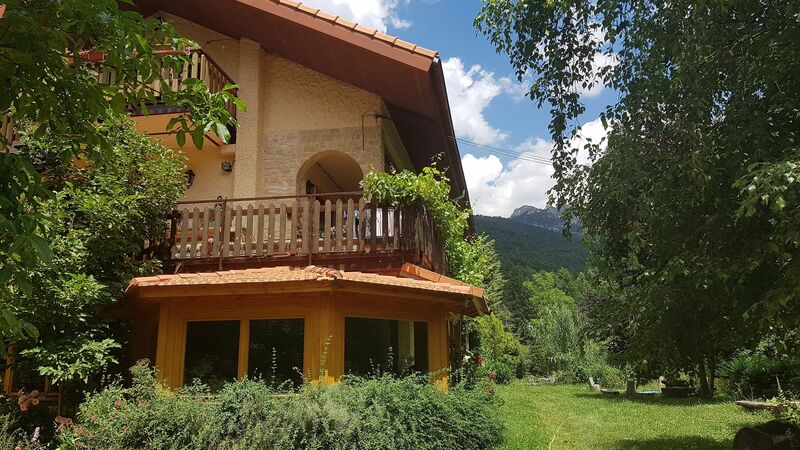 It has accommodation, a meditation hall and lots of outdoor space with views of the Siete Picos. Meditations will be around 30 minutes in length. We will start with guided meditations and gradually have less guidance over the weekend. At the dinner, on Friday we can meet the other participants. After the dinner we will go into noble silence – the silence helps us to deepen our meditation and mindfulness practice and to maintain a greater continuity of awareness. We’ll end the silence on Sunday morning and have time to talk with each other and have lunch together. The teachings will be based on modern mindfulness courses and also on the meditation traditions that mindfulness comes from (primarily the Buddhist meditation tradition). This will be ideal for people who have some meditation experience. If you’ve done meditations of 30 minutes before, then this retreat would be suitable for you. If you’ve never done a meditation retreat before, then this would a great first retreat. If you have done meditation retreats before, this retreat will help you to further deepen your practice. Darran has trained in world recognized mindfulness meditation centers in the United States and Asia and has trained as a mindfulness teacher with the University of Massachusetts. He has trained with some of the best-known meditation teachers in the world, including with teachers of Jon Kabat-Zinn (the person who first brought mindfulness into mainstream Western settings, often called “the father of mindfulness in the West”). Darran teaches Mindfulness at IE University and teaches on the Mindfulness teacher training program of Universidad Rey Juan Carlos. For the past decade he has been dedicated to the practice and teaching of mindfulness meditation. If you’re coming by public transport, you get the train to Cercedilla. The center is less than 4km from the station. From the station we get taxis to the center – we’ll try to organize it so that there are 3 or 4 people in each taxi, so it will be just a few euros per person. If you’re driving and would be willing to give other people a lift, please let us know. The cost of accommodation and meals for the weekend is €99. This includes accommodation in a room with 2 beds and includes all meals from dinner on Friday until breakfast on Sunday (dinner on Friday, breakfast, lunch and dinner on Saturday, breakfast on Sunday). (Lunch on Sunday is optional for an additional €13). The teaching of the retreat is offered on a donation basis. Participants will have an opportunity to make a donation at the end of the retreat if they wish. There is an ancient tradition of offering mindfulness and meditation teachings in this way. The retreat is now full. However, it's possible that there could be a cancellation. To join the wait list please send us a message using the Contact page and we'll let you know if there's a cancellation. "The class was peaceful and inspiring. I'm looking forward to the next one." "I feel very happy to have had the opportunity to attend the classes. They've already had a positive impact on my everyday life." "I came into the introductory class quite skeptical that I would be able to still my mind, but at the same time hopeful. I found the teacher's skillful guidance, attitude and presence to be calming and very helpful throughout the course, and I noticed with regular practice that I did increase my resilience and inner peace in general. After the course I still note the cumulative effect and would wholeheartedly recommend the practice of mindfulness meditation." "The benefits of mindfulness meditation were obvious in coping with my stress and anxiety level."